Following our jaunt to Tsukiji Fish Market, we killed several hours wandering around the streets of Tokyo, trying to get a feel for the city. Almost immediately after leaving the fish market, we stumbled upon a set of bustling alleyways filled with stalls and shops selling many of the same goods that had been available at Tsukiji. Although the scope wasn’t quite as awe-inspiring as Tsukiji, the atmosphere was just as vibrant, but without the sense of urgency and we felt far more comfortable to revel in the sights without worrying we were under foot. 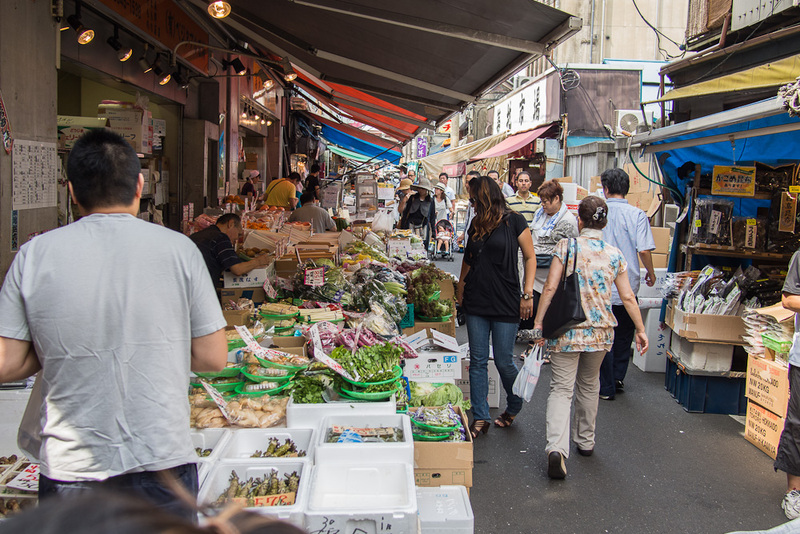 Tony and I both remarked that one of the wonderful things about Tokyo is that despite its cosmopolitan veneer, it’s so cool to see that it has such a healthy market & “street” culture, even if you have to delve slightly into the serpentine alleyways to find it. We wended our way through the alleys and unmarked streets, generally veering towards Tokyo Station, though in reality we spent most of the time vaguely lost. We didn’t really have anywhere to be, so although we initially felt flashes of panic as we realized that we had no idea where we were whatsoever, eventually we just began to embrace that this is inevitable when 90% of streets are unnamed and you are navigating off of free tourist maps. That being said, when you inevitably find yourself lost (largely because you will be incapable of locating yourself accurately on a map), the people of Tokyo are generally more than happy to help, often without any prompting on your part! We have found time and again that if you stand somewhere long enough with a map in hand and a furrowed brow, someone will attempt to come to your rescue. A small market just outside Tsukiji. Although our plan was to locate the Tokyo branch of the Japan National Tourism Office’s Tourist Information Center, by noon we had already been out exploring for nearly 7 hours and jetlag was beginning to catch up with us. Also, we SEVERELY underestimated just how horrifically humid it would be. Our friend L’Ell warned us that August is the worst time to visit Japan, so we will just get this over with now: L’Ell, you were 100% right and we apologize for not giving your warning more credence! We thought Nashville was bad, but Japan definitely proves that humidity trumps heat every time (not that it hasn’t also been quite hot at times too!). With the weather and our internal clocks against us, we were beginning to wilt, however, we really wanted to persevere as best we could. We knew if we succumbed to our desire to nap in the middle of the day, it would only prolong the disturbances in our sleep patterns. That said, we realized that it would be foolish to needlessly push ourselves to see and do things if the end result was simply that we would be miserable and cranky. We decided to deviate from our initial plan and make our way back to the hostel, but squeeze in a little sightseeing along the way so that we could make the most of our limited time in Tokyo. 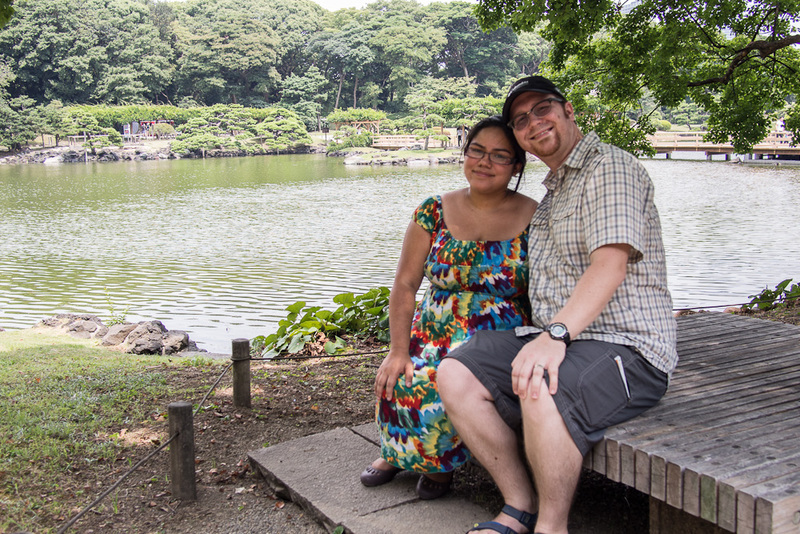 Rather than simply hopping on the Metro and riding the train back to Asakusa, we opted to take the subway to Hamarikyu-teinen, a traditional Japanese garden that lies along the banks of the Sumida-Gawa river. From there, we could catch a boat taxi and sail back to our hostel in style! It was patently clear that this was a much cooler way to return to our beds, and certainly had a fainter aroma of defeat to it. Tony and I have always really enjoyed the aesthetics of Japanese gardens, as well as the serenity they seem to exude. One of our first dates was at Cheekwood Botanical Garden in Nashville, TN, which happens to have a lovely little Japanese garden and a bamboo grove. We liked the place so well that we decided to get married there several years later! So we thought we knew Japanese gardens pretty well, but Hama-rikyu teinen was like nothing I had ever experienced before. When I think of gardens, I tend to think of fairly smaller, more intimate affairs. Hamarikyu was more like a park, in my mind because it was so sprawling and spacious. Engagement photos at the garden. Another view of the garden, towards Tokyo. Hamarikyu was so calm and peaceful, and perhaps because it is one of the few gardens you need to pay to visit in Tokyo (300Y), it was nearly deserted. If you find yourself wanting to escape from 21st century Tokyo, this is a wonderful green space where you can decompress and experience a little bit of what the locals did during Edo-era Japan. If it had not been so sticky, or if we had not been so tired, Hamarikyu is a place we could easily have spent a few hours enjoying. Alas, it was hot and we were tired, so we only saw a fraction of the garden before we made our way to the water bus station. Normally this kind of thing would drive me crazy (I’m the kind of person who likes to feel I got my money’s worth, so if I’ve paid to see a place, I want to see the WHOLE place), but I am really trying to use this trip as an opportunity to appreciate and cherish the experiences I do have, rather than lament the ones I did not. The tickets for the Sumida-Gawa cruise were a pricey 700Y per person, substantially more than subway fare, but given how much this Sumida-Gawa tour had been touted by all the guidebooks (seriously, our Frommers guide went so far as to claim that Hamarikyu is only worth a visit because you can catch the water bus here!) we had referenced, we were sure it would be worth the extra money. The “view” from the boat. These boats are similar, if a little less fancy, to the one we rode. 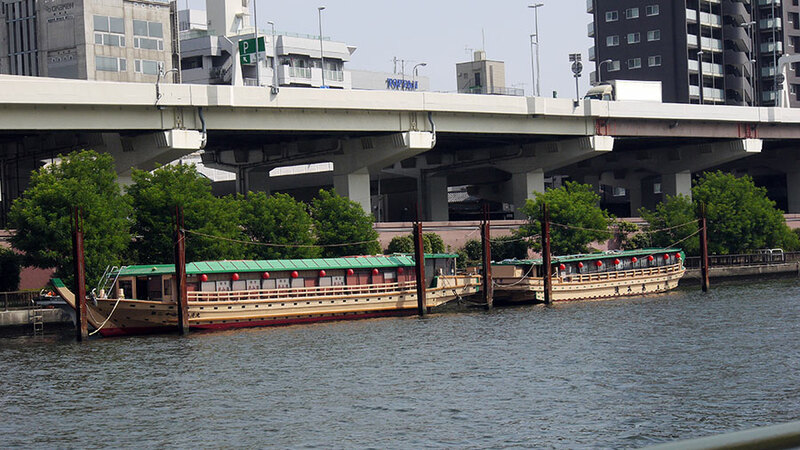 I know my review of the cruise is far from glowing and a little acerbic, but I don’t want to wrongfully give the impression that the Sumida-Gawa is a blight on Tokyo or anything like that. It was genuinely soothing and it was nice to just sit and be shuttled directly to the area of town we needed to reach without having to worry about transferring trains or anything like that. However, just like our jaunt to the fish market, expectations are key, and so if you go into this cruise thinking it will be like a bateau mouche tour of the Seine in Paris, you will be disappointed because it is not nearly so fun or so pretty. Chalk it up to another one of those things we’re glad we did, but no need to do more than once. On our last legs, we managed to make it from the water bus dock back to our hostel & enjoyed a 90-minute refresher nap. In our next post, we’ll finally wrap up our epic first day in Tokyo by telling you the story of our first proper meal, which really hammered home to us that we were miles from home. Stay tuned! Another really cool garden in Tokyo is Rikugien. It recreates scenes from a bunch of famous Japanese poems and is often considered Tokyo’s most beautiful garden, although I didn’t see enough other ones to make that statement myself. That does sound really cool! 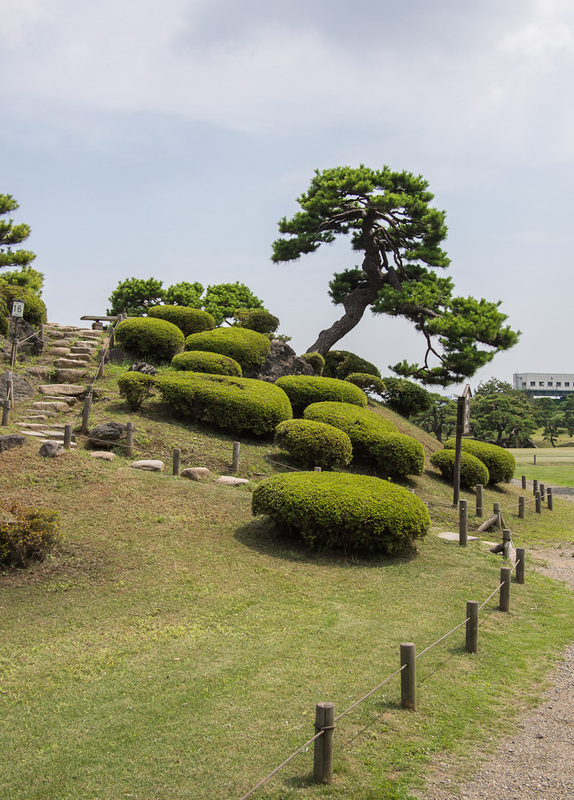 Unfortunately we only had 3 days to explore Tokyo so we didn’t get the chance to see Rikugien on this visit, but should we ever make it back to Japan, that one will certainly be at the top of my list! Ahhhh yes, that pesky humidity. I didn’t think you were truly understanding me when I was telling you about it. Combine that with jet-lag and I know exactly how you guys felt. If it’s sunny too, try buying a mini umbrella at a convenience store (lots of Japanese do it) for shade (I know what you’re thinking but it helps). Oh and those aren’t arm warmers the ladies are wearing – they are to prevent their arms from getting tanned! Getting a tan is not a good thing in Japan! I’ve never heard of that garden or the boat tour. Make sure you still check out the garden in Kanazawa. I love the way that even though you guys were exhausted you couldn’t just go back to the hostel, you had to sight-see the way back! Try to stay cool! Maybe check out a department store? That way you can stay cool and experience the insane shopping in Japan! I was just about to say this, Laura! I teach ESL, and many of my students wear long sleeves (here in Texas with 100% humidity and 100-degree weather) to keep from tanning. In many Asian cultures, that’s a big deal. I just can’t believe that people would go to such miserable lengths to avoid tanning! I mean, if you’re just going to wear long sleeves all the time anyway, no one will ever know if you got a tan or not! Also, I feel like I could appreciate it a bit more if they were wearing items made out of breathable, lightweight material that you could at least believe were cool… but some of them really are wearing sweatshirts and wool sweaters! 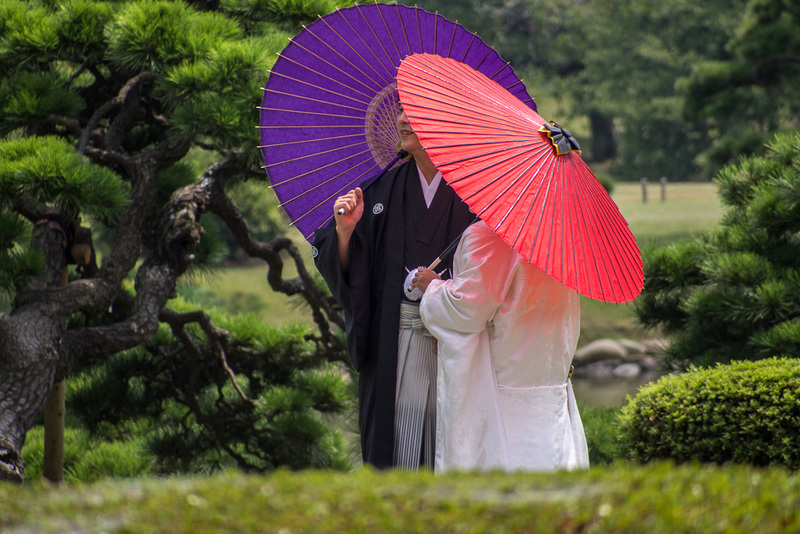 Don’t worry, we will still check out the garden in Kanazawa! Hamarikyu was really nice, but I am sure there are better gardens in Japan! Since we’ve moved out of Tokyo, the weather has been better: not quite so hot nor as humid (though it’s weird when it’s cool but still really humid out as we have experienced!). Still have to check out a department store… we are having a lazy day today, so maybe tonight! Expectations really do seem to be key here. It’s surprising what’s brought up in travelor’s guides – I wonder if payment is part of that process! I’ve not spent a lot of time world traveling, but in all of my experiences, it’s the stuff off-guide that I’ve enjoyed the most. Stuff like the Arc de Triumph in Paris couldn’t compare to the little run-down alley cafe we found for lunch, where a cat sat on the window right next to our table and occasionally flicked its tail at us, and Old City Jerusalem was a huge mass of people trying to hawk merch at us, whereas Ramallah, just outside Jerusalem, was a fantastic city to visit where you got to see real culture. Amanda recently posted..All About Vacation! Sometimes I think travel guides are written by people who didn’t even experience the things they are writing about! It seems like whichever country/city they are featuring just sends them material from their tourism office and they just make do with that… I can’t help but research places I am visiting so that I have some ideas of things to see and do, and certainly not all things in guidebooks are tourist traps, but you are right that getting off the beaten trail and just doing your own thing can certainly lead to some of the best experiences! I missed this garden! But then there are probably so many gardens in Tokyo that it is impossible to visit them all. 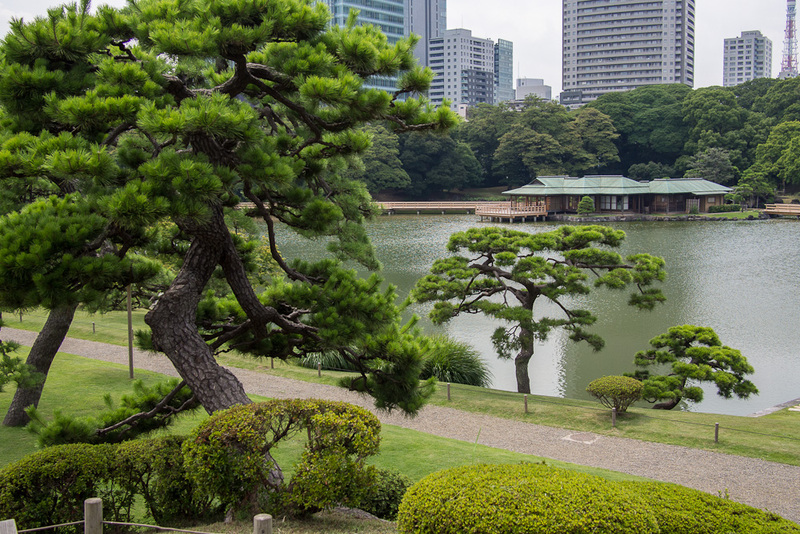 I too loved visiting gardens in Tokyo, visited the Hibiya garden and the Imperial East garden. The Boat Cruise was one of the highlights of my Japan journey as well. Yes, there are SO many gardens in Tokyo, and who’s to say this one was any better than the ones you saw! If we ever come back to Tokyo, we would certainly try a different one the next time, just to have a different experience.